I’ve written about music tech for years, but it was mostly guitar-mag product reviews. I had little grasp of how any of the tools actually worked. But over the last few years, I’ve become increasingly obsessed with how musical sound is created in both analog and digital realms. I’ve become involved into music software creation, first consulting with various companies, and more recently doing a great deal of development work for Apple’s Logic, GarageBand, and Mainstage programs. Since much of the work involved mimicking the sounds of analog gear via software, I resolved to finally understand the analog components I’d been using for most of my life. 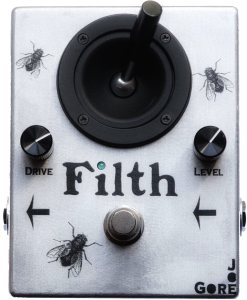 So I began building guitar pedals and amps (mostly pedals, because 9V batteries are less likely to kill you when you screw up, which I do incessantly from the instant I fire up the soldering iron till I power down to fetch the burn ointment). I’d never been anything like a workbench-type guy, but it’s become an obsessive hobby. I swear, I gained more insight into sound in the last couple of years than I’d acquired in the previous several decades. And for better or worse, I’ve just gone pro — my stompboxes are now available via Vintage King. 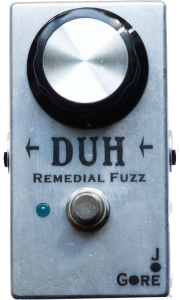 The first release is Duh Remedial Fuzz, with four additional pedals due Q1 2016. You can read about my first five pedals at gorepedals.com.